The big attraction to the M2 package should be the beautiful forty side 12"x12" magazine album. It also should be the impressive photo-wrap cover that up until this point was a pricey upgrade. The big attraction should be the award winning wedding photography that makes the album come alive with stories that are just dying to be told. It should be all of this but it's actually more than this. What’s the difference between the M1 package and the M2 package? The M2 package features a 12"x12" album which is 44% larger than the M1's 10"x10" album. The M2 has 40 sides as opposed to the 30 sides with the M1 package. We get a lot of people in interested in the M1 package but often walking away with the M2 package. By now you're probably wondering what the main differences are between them? The M2 comes with a couple of more hours of coverage versus the M1. This extra couple of hours is really what is needed with a larger weddings. The M1 is really designed for smaller weddings. Try to make the an M1 work when you're having a much larger day is like trying to squeeze into shoes that are a couple of sizes too small for you. You won't feel cheated or rushed on your wedding day with the M2. Having designed bridal magazine wedding albums for the past decade I can tell you that the leap from 30 to 40 sides is often fundamental. Forty to 50 sides starts to hit the law of diminishing returns. You wont' see as much value when you get to 50 sides. Forty sides seems to be the sweet spot for most bridal albums. I've watched thousands of people thumb through bridal albums. People sometimes get captivated in the album presentation though they never met the people in the albums. Most of our demo albums are between 30 and 40 sides but we have a few that have between 50 and 70 sides. Somewhere after 40 sides I notice that people start flipping through the pages faster. It's just like telling a story. Sometimes if it's too short you leave out some details and people ask "Is that it?" If it's too long you see their eyes glaze over a bit and they start squirming. Forty sides seems to be the overall favorite size of bridal album, and has been that way for a very long time. It's a couple of inches, what's the big deal? Those two inches means that the M2 is actually 44% larger than the M1. There is an image down below that shows the difference in the size of the two albums, it gives you an idea. When you visit with us be sure to ask about seeing the same album twice. 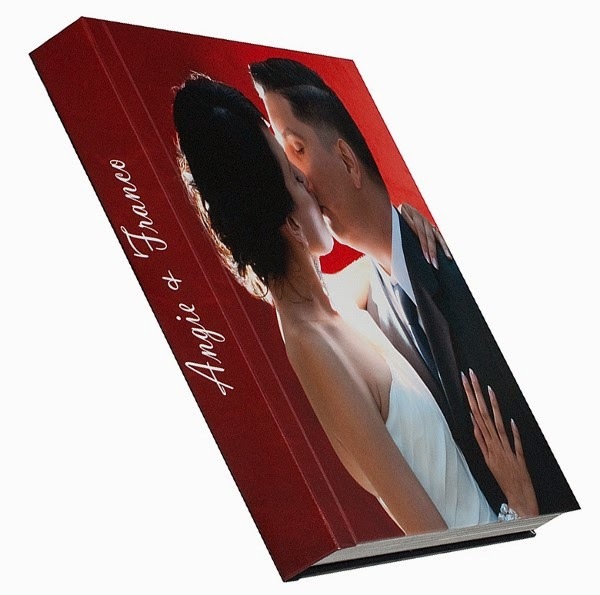 We have one wedding in a 10"x10" album and one as a 12"x12" album. The bottom line is that it doesn't even look like the same wedding. We shoot at lower ISO's with lenses that are super clean and well maintained. In group photos you'll start to see people's eye colors with the 12"x12" album. It's hard to justify one album over another. Sometimes we get brides who like the 10" albums better. But most prefer the larger albums. It's one of those things you'll have to see to decide for yourself. Many years ago we made a demo album with our Italian album manufacture. We had a full page spread of one image that was so spectacular that we asked to have it printed on Kodak Metallic paper, for that one page spread only. They thought about it for a week or so and finally did it. The results were so spectacular that they decided to offer it as a very expensive upgrade. Having seen many people look through the album over the years they always stop and marvel at this page. For years this was something special we'd do for clients. It's more expensive to do this, but that isn't the real issue. The process involves changing papers which is something that most album companies do once every couple of weeks. Our album company seems to do this every couple of days which makes offering this in an album package a reality for the first time ever. It's hard to describe what this looks like. If you can imagine printing a photograph on chrome instead of flat white paper then you start to get the idea. It gives a tad bit of a 3D look to the image. When we do it once in an album it really looks fantastic! Just the right size, just the right price! This package is similar in size and number of pages to our Sapphire package. This has been a popular size for many of bridal couples. These albums are amazing, and the size is something substantial without being heavy or looking pretentious. Between the the M1 and M2 Packages we cover a lot of ground and fit a lot of needs for our clients. With the M2 package we can cover more than enough of your day to tell an excellent story while helping you save money. The amount of coverage is perfect and the album doesn't feel like you short changed the story of your wedding day. We care a lot about the Momentum series of packages. We want our clients not only to be happy with their packages, but to love them and show them off to everybody. So far the buzz on them has been outstanding! Brides are coming back and ordering copies of parent albums because the parents have been so impressed with the albums. In the beginning they said they didn't need an album. Our former clients are showing off their wedding albums and their friends are contacting us when it's time for them to get married. Perhaps this all seems too good to be true, but it's true. For more information on the Momentum series please visit our M1 & M2 FAQ section. We have a short presentation that gets into the nuts and bolts of this package. It’s not something we currently mail out. We can answer some basic information about the package if you call us. You’ll find out just enough to learn that this package is legit and we’re not going to waste your time calling for a meeting just to try to up sell you on another package. For those of you who live out of state or can’t meet with us in person we have other ways of serving you. Please drop us a note or call us at (877) 789-1655.. Thanks! The M2 (back) and M1 (front) side by side.